You finally decided you were going to start counting your macros. 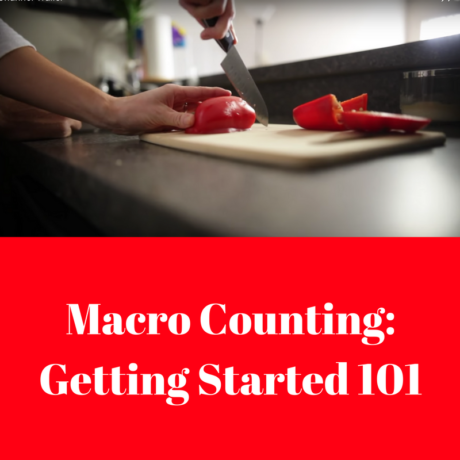 Maybe you’re tired of not seeing any results, so you realized you needed to count macros take it to the next level. But now you’re looking at the tracking app on your phone and you feel absolutely overwhelmed. It can be scary. This might seem like too much all at once. If you are working with a coach who just gave you your numbers, your next question is probably asking if they can give you some type of meal plan to get started. But the truth of the matter is that a meal plan won’t make you any better at tracking your macros. It’s just delaying the inevitable. Tracking your macros will actually MAKE YOU BETTER in the long-run. It will TEACH you about the foods that you are eating, and how to manipulate them to achieve your goals. You’ve probably heard the quote, “Give a man to fish, feed him for a day. Teach a man to fish, feed him for a lifetime.” That could not relate any more perfectly to tracking your macros. Could I tell you exactly what to eat in order to hit your macros? Absolutely. But what I’d rather do is teach you how to choose certain foods, and amounts of those foods, to reach your target numbers. This way, you are not only becoming more educated on the macronutrient content of your favorite foods, you are also learning what to do in the future when adjustments are necessary. You will learn certain foods are higher in protein, carbs, or fats. Some foods will be a blend of a couple of those categories. And from this, you will discover the keys to the puzzle that is “Counting Macros”. Depending on where you are in your own personal fitness journey, you may have a different starting point in counting your macros. If you don’t currently have a regimen, you may simply start by writing down all the foods you eat in a day. That is your starting point. Now you know what you ate that day. You can do that for a week or so before taking to the next level. If you already have an idea of what you eat, but still feel overwhelmed at the prospect of hitting your macros, start with simply tracking calories. In doing this, you will still see your macros in the tracking app. But you won’t have to worry yet about being close to your targets. Just get very close to your caloric intake goal. If we were to start the day looking at these numbers and eating without any strategy, we will probably be disappointed by the end of the day. It is very difficult to eat on a whim and get anywhere near where you’re supposed to be, unless you have been doing this for a while. So instead of hoping for the best, we’re going to take those daily totals and divide them by the number of meals we eat each day. Let’s use 4. Now that we know what we need in each meal, we can PLAN AHEAD to figure out what foods work with those numbers. I highly recommend planning your meals an entire day ahead of time when you’re first starting out. This way, you can use the trial and error method without actually having to make any errors with what you’re eating. If one combination of food doesn’t work, change the amounts or change one of the foods for something else that does. For this example, 8oz of chicken, 2 cups of rice, and 2 tbs of peanut butter gets us awfully close to our meal targets. But maybe we started off trying 3tbs of peanut butter, two pieces of wheat bread, and a protein shake. By putting it in a day ahead of time, we would see that these numbers are not close, and we could change them in order to hit our targets. Make a game out of it. See how many different meals you can come up with that are all very close to those numbers. Then you have built some “go-to’s” in your head and know what you need and can choose depending on what your craving! Most apps will save your favorite meals (most used) so you won’t have to take more than a few seconds to pop them into your phone. You won’t have to stick to the breakdown of even macros at every meal forever. But it is definitely the easiest way to get started. Once you’re a pro, you can divide them however you want. You will find out what makes you FEEL and PERFORM the best, and you can fine-tune your nutrient timing based on that. But while you’re establishing a routine and learning what works, this is how you’ll want to start.